Praising Scythe isn’t anything new; since the board game’s release in 2016, it has sat near the top of Board Game Geek’s charts. And for good reason! The first time my coworker invited me over to a game night and said we’d be playing a game set in a dystopian Europe in an alternate 1920’s timeline, I was hooked. After our inaugural round was finished, Scythe was firmly ingrained at the top of my personal board game rankings. Flash forward to the present where my copy of Scythe has been upgraded, polished, and cherished to the point where it’s bursting from the beautiful seams of the Legendary Box. If you discover any bells and/or whistles that I haven’t acquired yet, you can bet your bottom krona that they’ll be on their way to me before the end of the day. Dystopian literature has always been intriguing to me. Between 1984, Brave New World, Fahrenheit 451, and so many more, there’s something to be said about novels that get the wheels turning. Ideas that make us wonder, what if? What if the world was this way? What if the world is already heading there? What can we do to ensure that it doesn’t? And that’s where Scythe comes onto the scene. Let’s stop to think about the setting – 1920’s Europe. We have five countries that are trying to survive in the wake of war, surrounded by the remnants caused by war. There is this stark contrast between the living, breathing people and the terrifying machines of industry plodding through their fields. Think of the constant state of terror – even your own farming implements have been refitted with the weapons of war. And all around you, other nations are mobilizing in an attempt to cement their foothold on a continent that feels exhausted beyond repair. Games that capitalize on their theme and find a way to mentally transport us into the tiny wooden shoes of the meeples through their mechanics…those are the games that jazz me up the most. I don’t necessarily think that Scythe would have the same effect if the theme were something different, like a space colony builder or an orchard-management sim. In Scythe, the mechanics go hand-in-hand with the theme in an aesthetically orchestral way. There are three main reasons how the game accomplishes this, which I have outlined below. Imagine yourself working the fields, maybe growing some stunted wheat, when suddenly a dark plume of soot rises over a nearby hill, heralding the arrival of a rival nation’s mechs. Looking around, you realize that you’re all alone save for your fellow flesh-and-blood farmers. You’re forced to run away from the land that your family has tended for generations, all because of some greedy czar in a far-off palace that you’ll never see. Devastating. Combat in Scythe paints these sorts of visceral pictures every time that two players square off. Because of the relatively condensed board, when the game is played with 4+ players the threat of combat is ALWAYS THERE. You’re constantly looking over your figurative shoulder, trying to figure out if your resources are going to be safe for one more turn, or if you can risk moving a mech towards another player without it seeming like a direct challenge to another player. Losing popularity for forcing workers to retreat is an elegant way to dissuade combat, as popularity is arguably the most important resource for end-game scoring. At the same time, peasants spreading rumors about your ruthlessness might not phase you – your mighty war machine will continue conquering hexes until there’s nothing left to conquer. Gaining a combat card after combat also makes sense because the losing army is gaining valuable knowledge on potential strategies for beating their opponents. The simplicity of the combat dial also speaks volumes to the intricacies of war. In any conflict, simply throwing soldiers at the enemy isn’t a case of additive comparison; it’s much more complex than that. When engaging, the only things that both parties know for sure are a) the max amount of power they can use and b) the max number of combat cards they can use. That’s it. Those two tidbits of information funnel into the Over-Analyzer 3000 to calculate the odds of the opponent bluffing. But if they’re bluffing, then they think that I’ll call that bluff and then raise their power to beat my bluff. But what if they want me to spend my power so they can defeat me at a more strategic location next turn? What if they just want a combat card so they can spend it as a resource? Why are there so many choices?! It may be simple, but the secretive buildup to the dial reveal is agonizingly juicy. The second mechanic I’d like to touch on includes the multitude of strategies a player can use to win the game. The Rise of Fenris expansion compounds this idea with the new modules it introduces, but I don’t want to drop any major spoilers as you should really experience that box with completely fresh eyes. Trust me on that one. Players place six stars on the objective track to win. Each objective on the track can only be chosen once per player, but this leaves the actual win conditions open. Feasibly players could be sitting on a mission card and have enough resources to build their final mech, initiate combat and win, thereby placing three stars in a single turn triggering the end of the game. What I love about the objective system is that, as a player, you can capitalize on your nation’s strengths. Don’t want to win through intimidation and warfare? You don’t have to devote any resources towards winning combats at all. Want to invest in infrastructure and be a well-loved leader? Build structures and increase your popularity. If one strategy doesn’t seem to be working you can always shift towards new objectives without losing progress towards the ones that you are building towards (in case they become more attainable later). When a player is warmongering and sprawling their nation across the map, it really does feel as though they are a ‘global bully’ and oftentimes the other nations will unofficially ally up to put a stop to it. Other times you will have players who keep to themselves, slowly building an engine before venturing out to explore the world. Resource gathering makes perfect sense – wood for buildings, metal for mechs, etc. Being able to work towards whatever objectives you want helps create a unique experience every time that you play the game. Each nation tends to lend itself towards a certain playstyle, but bringing this back to the theme, it can be really engaging to try and reinvent the perception that others have of your faction. Playing with Saxony doesn’t have to be all blood, guts, and glory. The other players might expect that to be the case, but just like a real nation you can change your agenda and posture yourself politically where you can start to flip the script on those stereotypes. You can be the leader that others wouldn’t even dream that you could be! The final mechanic that I want to touch on are the encounters. 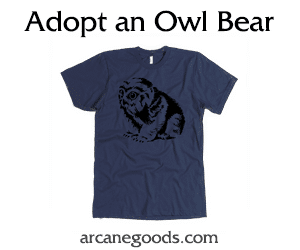 When your character goes gallivanting across the map in search of fame and fortune, they’ll trigger these encounters that offer you three choices. All of them follow the same logic: the first is a small positive, the second is a positive with a slight negative, and the third is a major positive with a substantial negative. The choices, however, aren’t the real reason why these encounters are so meaningful to the game. I mean, they can be complete game-changers, jumpstarting your engine or helping to close out an objective much quicker than you anticipated. These encounter cards breathe so much life into the world that I feel like I’m being transported into little 1920s vignettes. For example, there’s one card that shows Anna and her trusty bear companion Wojtek walking in between some farmers harvesting grain. Your choices are to have your bear help with the harvest, hire the workers to further your progress, or force the workers to harvest for you while you watch. Each of these choices has consequences, and you’ll be paying them depending on how to you handle the situation. Other cards depict mechs confronting villagers who don’t understand the language, or a festival with a mech looming ominously in the background. In fact, the artwork on the cards (which is fantastic) paints a vivid picture and instills this overwhelming sense of fear that exists when you always have a gargantuan machine looking observing your every move. So as your character is exploring the map, they are learning how other societies are coping with the plurality of living amongst mechs. Discovering how livestock and people interact in their fight for survival. Add in the race to the Factory and you’re left with this microcosm of deciding how much humanity you’re willing to sacrifice to industrialize and control the people. 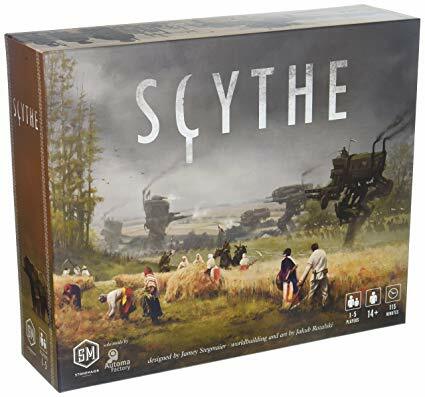 There are plenty of games where the theme and mechanics have a wonderfully symbiotic relationship, and I’d rank Scythe right up there near the top. From beginning to end, the tension at the table is tastefully palpable. I could talk at length about the exceptional production quality, usability of the components, and just the general awesomeness of this game, but so many others have already drawn from that well. What I CAN do is recommend that you give this game a shot – whether you’re really into dystopian alternate realities or love a solid engine-building game, Scythe can fill that void for you. Just don’t be surprised if you end up with a hefty Legendary Box on your gaming shelf within a matter of weeks!